CORVALLIS, Ore. – A survey of professionals in jobs related to Extension and aquaculture at universities and two federal agencies found that over half plan to retire in the next 10 years. 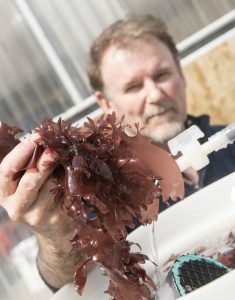 The finding comes as the U.S. government ramps up its funding for research on farming fish, shellfish and seaweed. Extension is a university-based, nationwide program that provides research-based information, educational opportunities, and technical expertise to help people, communities and businesses solve problems and be successful. Its aquaculture experts – including those with the national Sea Grant program – have expanded markets, trained workers on using new technologies, informed consumers about the nutritional benefits of seafood, and analyzed the economics of raising certain species. The survey was conducted by faculty with Oregon Sea Grant, Kentucky State University (KSU) and the University of Idaho (U of I). 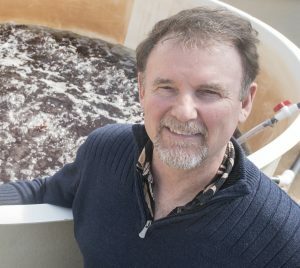 It was sent to about 160 people in the United States who attended the 2017 National Aquaculture Extension Conference, are on an aquaculture Extension listserv with the U.S. Department of Agriculture (USDA), or are on a fisheries Extension listserv with the National Oceanic and Atmospheric Administration’s (NOAA) Sea Grant program. 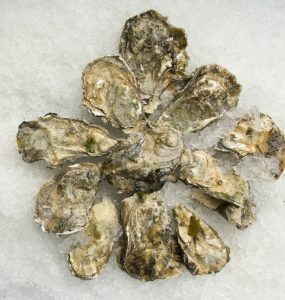 “We pretty much covered the entire population of people in the U.S. who either work for Extension and have some aspect of aquaculture in their jobs or who hold administrative or other positions that support Extension staff involved with aquaculture,” said Sam Chan, a watershed Extension specialist with Oregon Sea Grant who helped conduct the survey. Sixty-six people responded when asked how much longer they plan to work in their current position before retiring. A third said one to five years, and 20% said six to 10 years. That means that over half of the respondents could retire in the next 10 years. If that were extrapolated to the estimated total workforce of aquaculture Extension professionals and related administrators, Chan said, it would mean that over 80 people are planning to retire in the next decade. 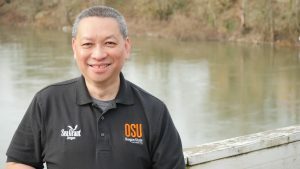 “Given the number of upcoming retirements, the window is becoming increasingly narrow for current aquaculture Extension specialists to recruit, train and mentor new professionals,” said Chan, who is a member of the National Aquaculture Extension Steering Committee and is based at Oregon State University. To attract new hires, Chan said, respondents suggested that universities emphasize the variety of professional backgrounds that a career in aquaculture Extension can use. For example, he said, knowledge of law, engineering, food science, economics and environmental science can be useful to Extension specialists who work in aquaculture. The survey asked people if they thought their institution or agency would refill their position with aquaculture Extension duties. Forty-four percent of the 68 respondents said yes and 46% said maybe. The survey also asked about age. Fifteen percent of the 64 people who responded to that question said they were at least 67 years old. Forty-five percent were 51 to 66 years old, and 34% were 36 to 50 years old. About a quarter of the 64 respondents were women, with a majority of the women between 36 and 50 years old. Sixty-seven people responded when asked how long they have worked in aquaculture Extension. Nearly half said they have worked in such a role for 16 to 31 or more years. Nearly 30% said no more than five years. The survey comes at a time when the federal government is working to grow the U.S. aquaculture industry by funding research and trainings. In October 2017, NOAA said it would award $9.3 million to 32 projects to support U.S. aquaculture. 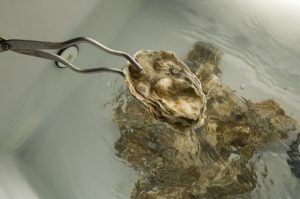 The next year, NOAA announced 22 additional grants totaling $11 million, also to advance U.S. aquaculture. “Growth in the domestic aquaculture industry holds great promise to create jobs and reduce our dependence on seafood imports,” Secretary of Commerce Wilbur Ross said at the time of the 2018 announcement. Forrest Wynne and Gary Fornshell, aquaculture Extension specialists at KSU and the U of I, respectively, helped conduct the survey. 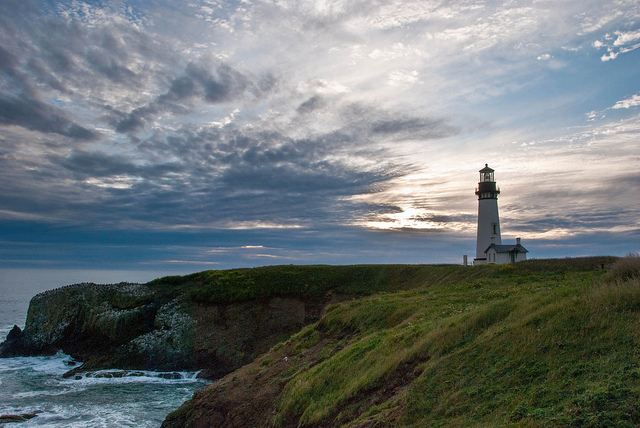 An open letter from Shelby Walker, director of Oregon Sea Grant, addresses the White House’s proposed elimination of Sea Grant and what it might mean for Oregonians and people in 30 other coastal and Great Lakes states around the country. Below is an excerpt from the one-page letter; you can read the full version at the link provided below. Oregon students from elementary school through community college will compete in Lincoln City on April 29 in an underwater robotics contest that tests their engineering and problem-solving skills. 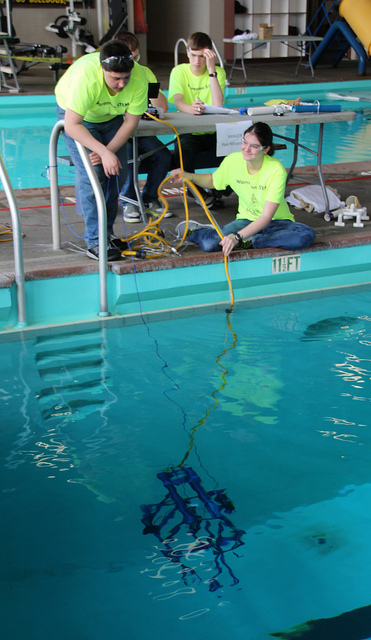 The students, who hail from 20 schools largely along the coast, will be showing off devices they built for the annual Oregon Regional MATE ROV competition, which is coordinated by Oregon Sea Grant and aims to prepare students for technical careers. The public is invited to attend the event, which will be held from 8 a.m. to 5 p.m. in the swimming pool at the Lincoln City Community Center at 2150 N.E. Oar Place. The event is one of about 30 regional contests around the world that are coordinated by the California-based Marine Advanced Technology Center (MATE). Top teams from Oregon qualify to compete in the International MATE ROV Competition, which will be held June 23-25 in Long Beach, Calif.
Each year a new theme is chosen. This year’s contest highlights the role of remotely operated vehicles — or ROVs — in securing the health and safety of seaports and helping lay the groundwork for “port cities of the future.” Like port managers, the students will guide their ROVs through tasks that simulate finding cargo containers that fell overboard, constructing an underwater tunnel, and cleaning up contaminated sediment. Students will also present posters or marketing displays they created and give engineering presentations. Students are also tasked with creating mock companies, thinking like entrepreneurs and working together to “manufacture, market, and sell” their ROVs. The students gain project management and communication skills as they manage a budget, work as a team, brainstorm solutions and deliver presentations, all skills transferable to other careers. Local marine technology professionals, engineers, and scientists from Oregon State University, the National Oceanic and Atmospheric Administration, and the Environmental Protection Agency volunteer as judges. Volunteer divers from the Oregon Coast Aquarium and OSU’s Scientific Dive Team also support the competition. Oregon Sea Grant is pleased to announce that Oregon State University graduate Elizabeth Cerny-Chipman has been selected as a 2017 John A. Knauss Marine Policy Fellow. Currently Cerny-Chipman is a post-doc marine ecologist in Bruce Menge’s lab at Oregon State University. For her dissertation, she studied the influence of environmental context on species interactions, with the goal of “better understanding how climate change will affect biological communities.” She also studied the ecological consequences of sea star wasting disease, which first appeared on the Oregon coast in 2014. Read more about the Knauss Fellowship here. OSG’s Sam Chan off to Washington, D.C.
Sam Chan, Oregon Sea Grant’s Extension watersheds and aquatic invasive species specialist, is headed to Washington, D.C. for a one-year assignment as National Extension Program Lead with the NOAA Sea Grant office. He starts there July 18, but is driving from Oregon to the East Coast with stops to visit several Great Lakes Sea Grant programs and to deliver the keynote address at the National Conference on Pharmaceuticals and Personal Care Products. 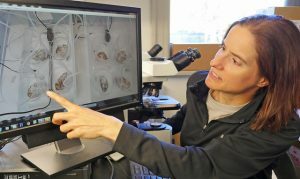 In Chan’s absence, Tania Siemens will handle invasive species outreach and education for Oregon Sea Grant. 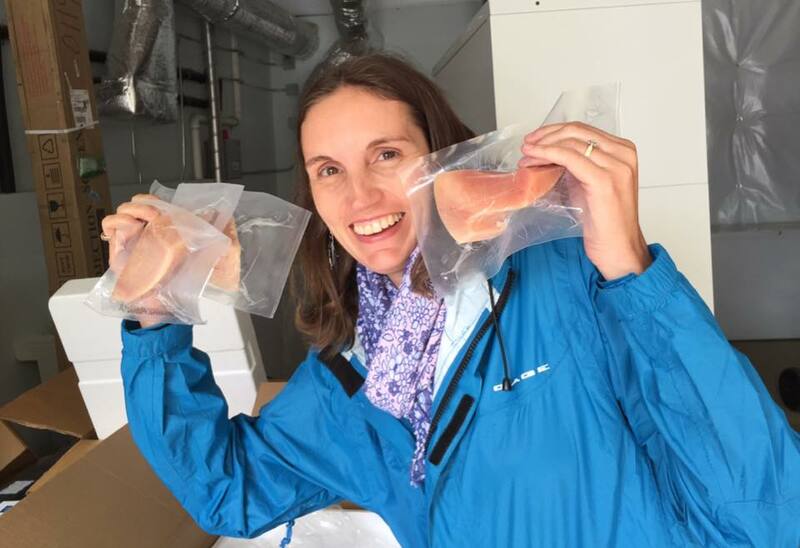 OSG specialist to serve up Pacific albacore in Washington, D.C.
NEWPORT – Kaety Jacobson, Oregon Sea Grant fisheries specialist, is packing her bags – and then some – for a trip to the nation’s capital to take part in the 41st annual NOAA Fish Fry. Thanks to a donation from the Oregon Albacore Commission, Jacobson will travel with 250 lbs of fresh-frozen albacore tuna loin portions – and a recipe for tuna poke, a Hawaiian-style marinated tuna salad, courtesy of Newport’s Local Ocean Seafoods restaurant. The Fish Fry, a popular summer event sponsored by the National Oceanic and Atmospheric Association runs Wednesday, June 8th from 6pm – 9pm at the Herbert C. Hoover Main Commerce Building on 14th St. and Constitution Avenue. The event promotes public understanding of aquaculture and sustainable marine fisheries. Sea Grant programs from around the country were invited to take part during our 50th anniversary year to showcase the variety of sustainable seafood from in the nation’s ocean and Great Lakes states. Melissa Errend is a catalyst in the ongoing reaction between science and policy. The self-described problem-solver is tasked with integrating fisheries and ocean science into the value-laden world of Congressional politics to support her boss, Sen. Maria Cantwell, and the people of Washington State. Errend is one of four Knauss Fellows from Oregon Sea Grant’s 2016–17 cohort. Run by the National Sea Grant office, the prestigious John A. Knauss Marine Policy Fellowship places graduate students focused on ocean and Great Lakes issues in legislative or executive offices in Washington, D.C., for a year. About 1,100 graduate students have participated in the program since its inception in 1979. This year, Errend is one of only 12 students serving in a legislative office, where she is a resident scientific expert informing political decisions, crafting questions for hearings, and assisting with writing novel policy to solve national problems. What is Sea Grant? Check out this new video and find out! Oregon Sea Grant is seeking qualified applicants for four graduate and postgraduate fellowships in marine science and policy. The NOAA Coastal Management Fellowship (deadline Friday, January 23, 2015) provides on-the-job education and training opportunities in coastal resource management and policy for postgraduate students while assisting state coastal zone management programs. The program matches postgraduate students with state coastal zone programs to work on projects proposed by the state and selected by the fellowship sponsor, the National Oceanic and Atmospheric Administration Coastal Services Center. This two-year opportunity offers a competitive salary, medical benefits, and travel and relocation expense reimbursement. Any student who will complete a master’s, doctoral, or professional degree program in natural resource management or environmental-related studies at an accredited U.S. university between January 1, 2014, and July 31, 2015, is eligible. The National Marine Fisheries Service/Sea Grant Graduate Fellowship Program in Marine Resource Economics (deadline Thursday, January 29, 2015) expects to award at least two new PhD Fellowships starting Aug. 1, 2015 to students who are interested in careers related to marine ecosystem and population dynamics. The Fellowships can provide support for up to three years for highly qualified graduate students working toward a PhD in quantitative ecology, ecosystem ecology, population dynamics or related fields of study. Fellows will work on thesis problems of public interest and relevance to NMFS under the guidance of National Marine Fisheries Service (NMFS) mentors at participating NMFS Science Centers or Offices. Applicants must be United States citizens, and at the time they apply must be admitted to a PhD program in a relevant field of study at a US institution. The NMFS/Sea Grant Graduate Fellowship Program in Population and Ecosystem Dynamics (deadline Thursday, January 29, 2015) generally awards two new PhD Fellowships each year to students who are interested in careers related to the development and implementation of quantitative methods for assessing the economics of the conservation and management of living marine resources. Fellows will work on thesis problems of public interest and relevance to NMFS under the guidance of NMFS mentors at participating NMFS Science Centers or Offices. The Fellowship can provide support for up to two years for highly qualified graduate students working towards a Ph.D. in in marine resource economics, natural resource economics, or environmental economics. Applicants admitted to a PhD degree program in resource or environmental economics at a US institution. Dean John A. Knauss Marine Policy Fellowships (deadline Friday, February 13, 2015) provides a unique educational experience to students enrolled in graduate programs in fields related to marine or Great Lakes studies. The program matches highly qualified graduate students with hosts in the legislative branch, the executive branch, or appropriate associations and institutions located in the Washington, D.C. area. Recipients spend one year working on substantive national policy issues related to marine issues; a stipend is provided. The Fellowship is open to any student, regardless of citizenship, who is enrolled toward a degree in a graduate or professional program at an accredited US institution. For all four opportunities, completed applications must be delivered to the Oregon Sea Grant program office in Suite 350 of the University Plaza Building, 15th and Western in Corvallis, by 5 pm on the deadline date. 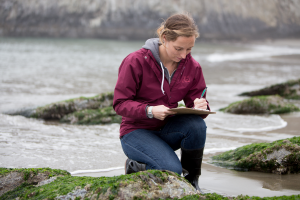 Fellowships and Internships from Oregon Sea GrantJohn A. Knauss Marine Policy Fellowships – current and anticipated future offerings for graduate and undergraduate students. Check out Alaska Sea Grant’s video featuring former Knauss Fellows describing their experiences and how that shaped their careers.